At this conclusion of another challenging and successful academic year, I would like to thank all our staff, faculty, students, alumni and friends for all their hard work, extraordinary contributions and many levels of engagement in our Faculty community. We are proud of our accomplishments in the past year, some of which are highlighted in this Newsletter. This has been a year of great progress and I look forward to continuing our momentum and collaborative work building upon our outstanding Engineering programs. Over the summer I anticipate sharing with you the inaugural annual report that shows our Faculty’s performance indicators. This document will outline quantitative markers of our progress and successes and provide insight on areas of potential and growth over time. On behalf of the Faculty, I wish you and your families a very enjoyable and restful summer and look forward to another rewarding academic year! Last fall we welcomed 1,202 first year students to the Engineering community. This was the most diverse first year class in our 135-year history, with students from all 10 Canadian provinces, 45 countries, and every continent. Our retention rate between first and second year for 2008 increased to 88% from 83% in the previous two years. This is a rewarding result of our Faculty’s recruitment and retention efforts, which included activities that cultivate both study and life skills, such as the Success 101 program, and transition programming intended specifically for international students, such as the new mentoring and coaching programs. Recruitment activities expanded to include international recruitment in Hong Kong and Qatar, and we continued to grow our international presence in Malaysia and the United Arab Emirates. We saw a 4% increase in applications overall this year and an 11% increase in out-of-province applicants. We have increased our intake this year while maintaining consistent admission standards with last year. The entering average is 89% across the Faculty, and 94% for Engineering Science. We streamlined our admissions process to allow early offers of admission to top applicants in February and a more selective admissions process overall. To further strengthen our recruitment efforts, we appointed an Outreach Task Force (PDF) to identify activities synergistically aligned with our academic mission, linked to our recruitment efforts. While it was decided to reduce our programming for the summer, we continued to offer the da Vinci Engineering Enrichment Program (DEEP), Saturday Science and Engineering Academy, Girls Club, and RobotX. The Report of the Outreach Task Force (PDF) is now available online. Five recommendations were suggested, including a definition of 'outreach'; the identification of three primary purposes and measures for Pre-University Outreach; the establishment of a Faculty Outreach Office to report to the Chair, First Year; the clarification of current and future programs. On behalf of the Faculty, we express gratitude to members of the Outreach Task Force. Our educational programs aim to provide students with the knowledge and skills to become Engineering leaders of tomorrow. Starting in June 2009, the Faculty will be granting two Bachelor degrees – the traditional BASc and a new BASc in Engineering Science. The new degree for graduates of Engineering Science gives recognition for the distinctiveness of this program. The Faculty is one of a very small number of schools in the world to offer a full slate of high quality Engineering programs in addition to a truly distinct Engineering Science program, and offering two degrees makes people more aware of this fact. Read more about Engineering's new degrees. This fall we will start a Sustainable Energy Minor and an Environmental Engineering Minor with 145 and 95 students, respectively, registered to date. Planning for a new Minor in Globalization is underway as well. Within EngSci we introduced a major in Energy Systems in fall 2008 and obtained approval for a combined Electrical and Computer Major to begin in fall 2009. Graduate students now have the opportunity to combine their MEng degree and the ELITE certificate as a unique co-curricular program. We recently introduced the MEng/Engineering and Public Policy graduate certificate as well. All Departments have implemented the fast-track option for exceptional MASc students into the PhD program. Additionally, three multidisciplinary graduate programs received funding from NSERC’s CREATE program this year. We established two new Extra-Departmental Units (EDU) that will advance and administer new curricular and co-curricular activities to further strengthen our educational offerings. The Centre for Global Engineering (CGEN) and the Identity, Privacy and Security Institute (IPSI) were created as EDU:C and we also established a Cross-Disciplinary Programs Office. CGEN will foster research in global engineering, with topics encompassing globalization of the work place and sustainable international development, and will help coordinate globalization activities of our Faculty. IPSI will work collaboratively with the Faculty of Information to develop new approaches to privacy that maintain the security, freedom and safety of the user and the broader community. The Cross-Disciplinary Programs Office will provide leadership, administration and initiation of programs that cut across the Faculty. This year we introduced a Faculty-wide series of lectures and panel discussions that promote best practices in teaching and foster excellence in Engineering education. The programs included Excellence in Engineering Education (E³), which to date has addressed the topics of teaching large classes and teaching tools and technologies. From May 27-29, we hosted at U of T, with Waterloo and Queen’s, a new-instructor workshop, Engineering a Successful Teaching Experience. Our Professional Development Centre merged with the U of T School of Continuing Studies this year. Our long-time instructors will continue to deliver a full range of industry-relevant curriculum in engineering and applied science to our client base. Visit the SCS website for more information. This past year we worked successfully with Professional Engineers of Ontario (PEO) to introduce a Specific Scope Licence as an alternative to the PEng for faculty without an undergraduate degree in Engineering, but who are active in research and teaching in Engineering Science and Engineering Design. In spring 2009, 54 faculty members wrote the PPE examination to qualify for one or other of the licences, which provides the potential for more than 92% of our total faculty to become licensed. Last fall we welcomed 14 new faculty members, 453 new graduate students, and 1,202 first-year students to our thriving community. This past year’s First-Year class was the most diverse in our 135-year history. Students joined us from all 10 Canadian provinces, 45 countries, and every continent. 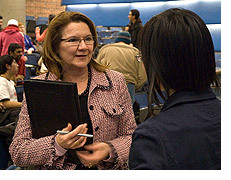 In February 2008, we hosted the first Dean's Town Hall meeting with undergraduate students. The success of this forum encouraged us to continue to hold one Town Hall per term. Hosted by the Faculty’s senior leadership and the Engineering Society Executive, we have addressed student needs that were identified in these meetings, including improved computer labs with 24/7 access, remote access to most software required for courses and accommodation for student clubs. 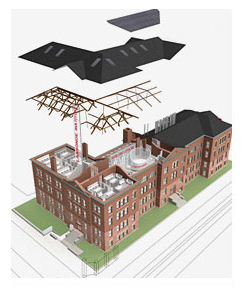 The renovation of the Sandford Fleming Atrium as a hub of student activity is also of great importance to students and the first phase will proceed this summer. We look forward to continuing to foster an open dialogue with students in the future. In addition to the Town Halls, we will introduce a monthly student enewsletter to communicate more effectively with students on a regular basis. This will replace the Registrar’s Office “Registrar Direct” enewsletter that was produced three times per year. With nearly 60 student clubs and teams that are a vibrant part of student life in Engineering, our students continue to push boundaries with their creative ideas and innovative solutions. Our Formula SAE Team ranks fourth in the world out of 505 student teams that participate in Formula SAE competitions worldwide. Our team was the only Canadian team in the top 10 ranking and second in North America. The U of T Aeronautics Team placed 13th out of 31 teams in the SAE International Aero Design Regular Class competition and ninth out of 15 teams in its first entry in the Micro Class competition. Our Rise and Improvise Dance Club also did very well this year, placing first and sixth in two separate competitions. The Eyes of Hope Club, dedicated to improving living conditions worldwide, raised over $10,000 for non-governmental organizations. Our students coordinated a number of conferences and showcases this year, including the annual UnERD conference that promotes research and technology projects conducted by Engineering students over the summer months. EngSci Aero student Jeff Nagashima participated in the City’s Nuit Blanche event. Engineering students installed a memorial on November 11 in memory of the 628 U of T staff, students, faculty, and alumni who died during WWI. Visitors left hundreds of poppies by crosses that were individually named for each of the 628 fallen heroes. We take the opportunity to thank Jonathan Asmis, outgoing President of EngSoc, and members of the executive for their dedication and determination in this past year. Under Jonathan’s leadership, EngSoc established a new food services outlet in the SF Atrium, and started the Atrium renovations. We welcome the 2009-2010 EngSoc executive, led by Jimmy Lu and look forward to another productive year. Our Faculty is ranked first in Canada and ninth in the world in citations, receiving 4,149 citations from 2003-2007. We also rank first among all Canadian universities in NSERC grants received from 2004-2008. Congratulations to Professors Andreas Mandelis, Canada Research Chair (CRC) in Diffusion-Wave Sciences and Technologies, and Yu Sun, CRC in Micro and Nanoengineering Systems. Professor Mohini Sain received support of his research to invent new ways to make car parts out of crops. Professor Elizabeth Edwards and her team received $5M toward $10.9M budget to research sustainable alternatives to fossil fuels and novel bioremediation approaches. AUTO21 announced funding for 20 new programs – and in five projects, U of T Engineering researchers are "behind the wheel." Teams led by University Professor Michael Sefton and Professor Uwe Erb received a total of $27.5M in funding with half from the ORF-RE program and Ministry of Research and Innovation. Congratulations to Professors Elizabeth Edwards, Greg Evans, Javad Mostaghimi, Chul Park, Robert Zee, and University Professor Michael Sefton as well as their teams. With $11M from the federal government and province and private donations totalling $9M, the Innovation Centre for the Canadian Mining Industry construction is underway. Last year, Professor Yu-Ling Cheng, ChemE agreed to continue in her role of Speaker for Faculty Council. The Faculty hosted two meetings this year that approved changes to our undergraduate curriculum, and established the following: Centre for Global Engineering (CGEN); Identity, Privacy and Security Institute (IPSI); and Cross-Disciplinary Programs Office. To review minutes and activities of Faculty Council, visit the website. All meetings take place in the Michael E. Charles Council Chamber (GB 202) from 12:10-2:00 pm. The Faculty has established a set of major fundraising priorities and got approval of the Case for Support. Our overall objective is to increase fundraising to $20 million per year on a sustainable basis. Our Engineering Advancement Office has implemented a number of new programs for alumni and prospective donors, including the Skule™ Society (formerly annual fund donors at the $1,200-$25,000 level). A number of donations are currently in progress and we look forward to formally announcing them in the near future. The growing diversity of our Faculty is our strength, and the women and men of Engineering at U of T are our greatest resource. Collectively, our rich cultural backgrounds, beliefs, and experiences bring us closer to our goal of becoming a truly inclusive and global community. Female undergraduate enrolment, which peaked in 2001, is again increasing with 22.9% in first year. Female graduate student enrolment remains steady at about 25%. 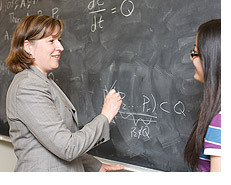 Female assistant professors has increased from 18.9% in 2006 to 34% in 2009 and our total professoriate is 14.3%. To continue expanding our diverse talent pool and creating a welcoming environment in which all members flourish, we appointed Lisa Simpson-Camilleri to the new position of Assistant Dean, Academic HR and Diversity. In the past year we received 30% of all major awards in Canadian Engineering Faculties. Among our achievements in U of T awards are six Awards of Excellence, 14 Cressy Awards, five Arbor Awards and six staff were recognized with Stepping UP awards. We are honoured by Javad Mostaghimi’s appointment as University of Toronto Distinguished Professor in Plasma Engineering. All in all, we received 30% of all major awards in Canadian Engineering programs. View the complete list of awards online. Our Engineering Newsletter is now a regular twice-monthly feature and was further developed this year in response to the results of a reader survey. We made progress in obtaining coverage in internal and external media, with an increase of 33% and 18%, respectively.Last summer we began using Twitter, a micro-blogging networking tool, to increase our communications and better share our stories with our internal and external communities. We have close to 300 followers (and quickly growing!) and we were one of the first University accounts created in Canada. Follow Engineering at U of T on Twitter. 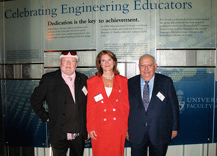 On September 29, 2008, the Faculty hosted our first Celebrating Engineering Education event and unveiled a permanent display in the Bahen Atrium in recognition of Engineering’s educational excellence and contributions of textbook authors. Of particular note, we honoured special guests ECE Professor Emeritus K.C. Smith and alumnus and former U of T Provost and Professor Adel Sedra, who celebrated the one-millionth sale of their textbook Microelectronic Circuits. Read the list of Engineering at U of T textbook authors. A comprehensive Divisional Space Review and updating of our master plan has concluded, with thanks to everyone who provided valuable input in helping us finalize this report. The report identified that 62,500 nasms of space occupied in 16 buildings is insufficient for our needs, and as much as 69% of this existing space requires appropriate upgrading. We are delighted to welcome new professorial hires for 2009-2010 and will include biographical information in the Engineering Newsletter in September. We welcomed new administrative and technical staff to the Faculty's community and congratulated staff who were assuming new responsibilities within Engineering.